Discarded smartphones and other gadgets are poisoning the environment and people in developing countries, where most of the world’s electronic waste (e-waste) is being dumped illegally and now involves criminal gangs, the UN’s environment arm warned in a report this week. The United Nations Environment Programme (UNEP) said between 60-90% of electronic waste is ending up in mountains of rubbish throughout the developing world, or is traded through criminal e-waste smuggling networks worth billions of dollars. This is in violation of the Basel Convention, which aims to control international trade of hazardous substances. Without proper facilities, the removal of copper, lead, plastics from discarded electronic items pollutes local air, soil and water, widening the health impacts of a sector already hazardous to workers tasked with stripping resalable components. In southern China and West Africa, sprawling complexes of garage-style workshops employ tens of thousands to extract valuable material and compounds from electrical items which are being discarded an ever-increasing rate. The electronics industry, which according to the UNEP report currently generates 41 million tonnes of e-waste, is expected to grow to an annual 50 million tonnes as early as 2017. "We are witnessing an unprecedented amount of electronic waste rolling out over the world,” said UNEP executive director Achim Steiner in a statement. The illegal, and largely secretive, trade in e-waste is difficult to measure, but the report estimates a scale of at least US$19 billion annually. Varying standards used by exporting and importing countries in regulation of e-waste makes it difficult to combat the illegal trade and enables informal markets to thrive. According to the report, the illegal e-waste trade is driven by a ban on exports of hazardous materials from members of the Organisation for Economic Co-operation and Development (OECD) to non-OECD countries. The report also notes attempts by nations that import e-waste, such as China's 'Green Fence' operation launched in 2013 to combat e-waste smugglers, often result in smuggling networks switching to new transit routes for the illicit cargo. Countries in which e-waste is currently dumped or smuggled typically have relatively weak environmental or enforcement standards. When shipped, unwanted electronic goods banned for export are deliberately mislabelled, the UNEP report said. Batteries, for instance, can be smuggled as either “plastic” or “mixed scrap metal”. Growth in the use of electronics in Asia means consumers in these countries are catching up with their counterparts in OECD member states, making it likely even greater amounts of hazardous waste will be shipped to Africa, where wages are lower and environmental safeguards weaker. 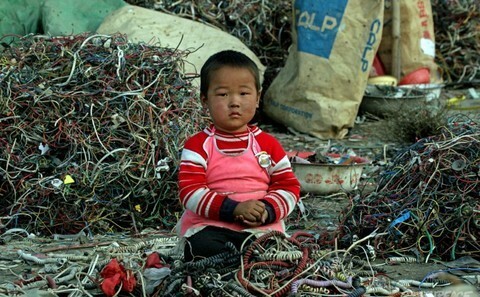 But at present, China, and the Pearl River Delta in particular, remains a major destination of e-waste. China‘s population of 1.3 billion, a big increase in living standards and massive expansion in the manufacture of cheap, relatively short-life electronic goods means that e-waste is likely to remain a major domestic environmental problem, even if a higher percentage of waste is likely to be shipped to poorer countries in West Africa. Since the last decade, African brokers have been operating in southern China to collect second-hand goods, such as kettles, shavers, washing machines to be transported to countries such as Ghana and Nigeria. China had well over a billion mobile phones in circulation as of late 2014, many of which will be discarded as newer, more advanced handsets become available. The country as a whole generated an estimated 1.7 million tonnes of e-waste in 2006, a number expected to rise to 5.4 million tonnes in 2015. UNEP recommended some potential solutions to the problem that should involve both developed and developing countries, including monitoring of e-waste trade routes, and closer safeguards against possible involvement of organised crime. It added that countries should also beef up enforcement and co-operate more closely to encourage the safe return of illegal waste shipments, and bolster international agreements.